Join Heather on this special taste of Europe! Tour price is $1869 per person. Current total cost per person for the tour, prepaid gratuities, travel insurance and current DFW round trip flights is $2998 per person. If you have have air miles we can utilize for this marvelous adventure we are happy for you to use those. A full day to savor our rich program of optional activities: take a panoramic tour of London’s landmarks, visit the Tower of London, or choose an excursion to Windsor Castle. Tonight, how about dinner followed by a leisurely cruise on the Thames River? Transfer to the railway station and board the EUROSTAR TRAIN to Brussels. Here, board your comfortable motorcoach for an orientation drive of the Belgian capital. 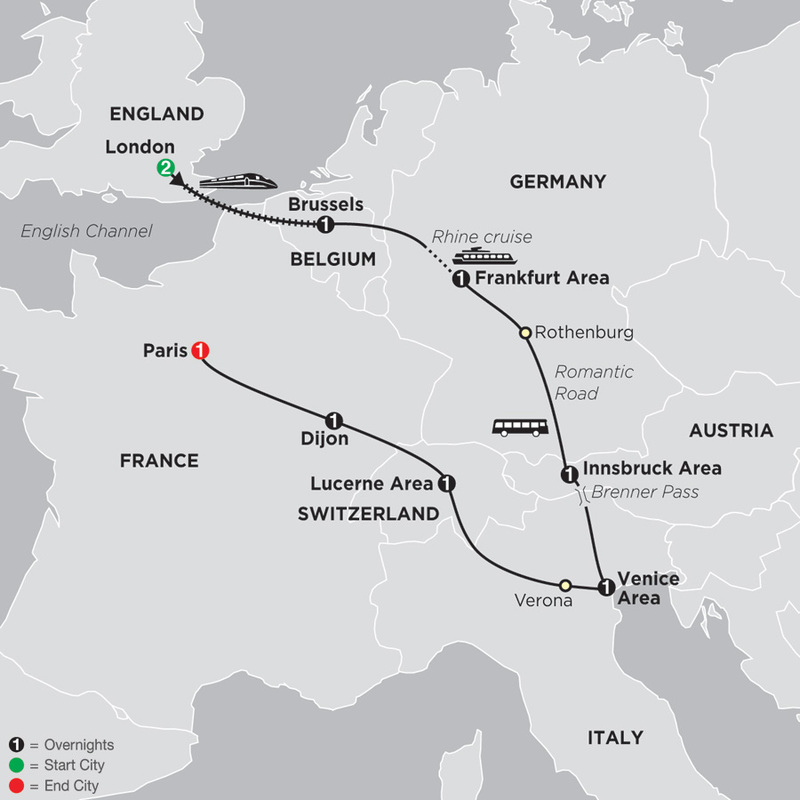 Journey into Germany to the shores of the mighty Rhine to enjoy a scenic CRUISE. Then, on to the Frankfurt area for an overnight. Today’s highlight is a drive along the Romantic Road, through towns and villages with medieval towered gates and battlements, squares of half-timbered houses, and richly decorated fountains. Spend some time in the center of Rothenburg before heading to the Innsbruck area for an overnight. Take in the breathtaking scenery of the Alps while crossing the Europa Bridge and Brenner Pass. Arrive in Venice, where a BOAT RIDE along the Giudecca Canal to Piazza San Marco allows you to admire the palazzos and maze of streets. Time at leisure to soak up the magical atmosphere of this unique city. At a GLASSBLOWING WORKSHOP, experience this Venetian art. Stop in fascinating Verona and see Juliet’s legendary balcony. Cross the Swiss border and enjoy the idyllic views of Canton Ticino, then on to the breathtaking beauty of Lake Lucerne. Your visit this morning focuses on the Old Town in the heart of Lucerne. Also, there’s time for an optional excursion to Mount Stanserhorn. In the afternoon, journey into France for an overnight in the charming town of Dijon. Leave Dijon and travel on the autoroute to Paris, where included sightseeing with a local expert shows you many of the best-known Parisian sites. Au revoir. Your vacation ends with breakfast this morning.